Get ready for one of the funniest nights of your life as Tenacious D comes to Queen Elizabeth Theatre on Thursday 13th December 2018! Kyle Gass and Jack Black are back and they're ready to rock with brand new material from their upcoming album Post-Apocalypto! Anything from the twisted minds behind "Tribute" is bound to have you rolling in the aisles, so warm up those chuckle muscles and prepare to get silly! 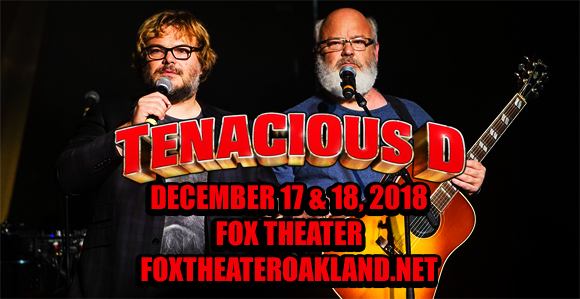 In 1994, in Los Angles, California, actors and best friends Jack Black and Kyle Gass formed the comedy rock band Tenacious D. The duo began writing and performing live together and in the mid-1990s they released a demo tape called Tenacious Demo, which lead HBO to offer them a TV show. Premiering on HBO in 1997, the three-episode series was broadcast from 1997 through 2000 and introduced Tenacious D to a wider audience. In 1999, they released their self-titled debut and the following year they signed to Epic Records. The Pick of Destiny is Tenacious D's first film – it was released in 2006 and starred Black and Gass, who also wrote the music. The duo's cover of "The Last in Line" on the Dio tribute album This Is Your Life won the Grammy Award for Best Metal Performance at the 2014 awards ceremony. The duo are currently working on their fourth studio album, Post-Apocalypto, which is slated for a 2018 release.